When I was in art school at The College of Brockport in Brockport, New York, ten years gone by now, I often wondered what kind of artwork my art professors were creating in their own studios, or if they were even creating at all. Students put a lot of money and trust into their art programs and the professors who guide them through said program. What would it say to emerging artists, still fresh and newly inducted into the art creation process, if their leaders, mentors, and guides weren’t toiling away at their own artwork? Luckily the art students registered in the Department of Visual Arts program at Northern Kentucky University don’t have to worry about that. At NKU, every January, members of the Department of Visual Arts, fulltime and adjunct staff alike, have the opportunity to share their artwork with the students and the public. The FE14: Full and Part-time Visual Arts Faculty Exhibition had something for everyone with different art mediums, including: painting, drawing, printmaking, photography, sculpture, film, graphic design, and more. I prefer to go when it’s quiet, which means during non-openings. When I went to review this particular show, I had the gallery space to myself and wandered around to my heart’s content without any distractions. Perhaps I was in a contemplative mood that day, but as I walked around NKU’s gallery spaces, I’ve always been impressed with the two room set-up they have, with lots of inviting wall space and plenty of breathing room to accommodate decent sized audiences, I was immediately entranced with Jeremy Plunkett’s PAUSE IV. 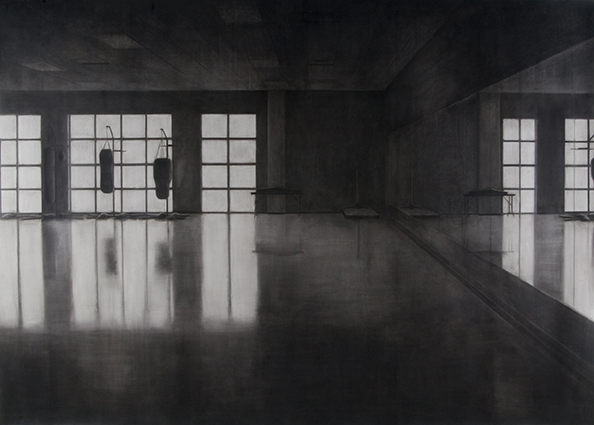 I found myself, as the title stresses, pausing for quite a while in front of Plunkett’s charcoal on canvas drawing of what appears to be an empty workout room. To me the space looked lonely, as spaces so often look when they aren’t being used for the purpose they were destined for. Plunkett’s exploration of light, or lack of light, through the process of reduction, or as he says on his web site’s artist statement, “erasing” helps to create a melancholy mood. As I looked at his imagery, I kept thinking of the space as tomblike, all quiet and somber. I must admit I was feeling kind of unnerved and ill at ease viewing this space, how sad a space can look when it’s void of energy, people, or activity. Even though I am not one to frequent workout rooms or gyms in general, I felt that Plunkett had created a beautiful, peaceful, and haunting piece of art. Daniel L. Smith creates exquisite pen and ink drawings with careful attention paid to the movement of lines in order to form intricate line details and graceful imagery. 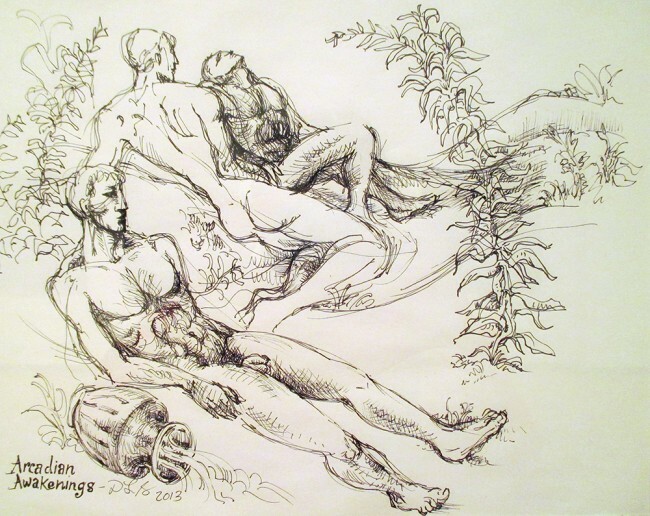 There is a sense of antiquity in his drawings, of times lost in the golden past. In Arcadian Awakenings, we see three naked men, with gloriously muscled bodies, lying casually in a field or a valley of a mountain. In the left hand bottom corner a vase or urn-like vessel sits on its side, its contents spilling onto the grass it sits on. There is nothing lewd or perverse going on in this scene; instead I feel a sense of magical communal intimacy when I look at this illustration. These men, in various states of relaxation, seem to be awakening from a deep sleep. The word “Arcadian” has several meanings. The simplest refers to a region and culture of people who lived in ancient Greece. But more importantly here, I believe Arcadian is a reference to an idyllic way of living, long since crumbled into dust, much like the ancient Greek civilization. It’s a tranquil and serene life where man and nature seem to coexist peacefully together. Perhaps the urn in the bottom left corner is symbolic of a Pandora-like vessel, releasing violence and chaos on the serene scene before us. Arcadian also denotes a sort of fantastic, golden, unattainable way of life. But even so isn’t it lovely to have something to dream about? On first glance Ana England’s Slough 1 and Slough 3 brought to mind the idea of funeral shrouds or sarcophagus-like vessels. 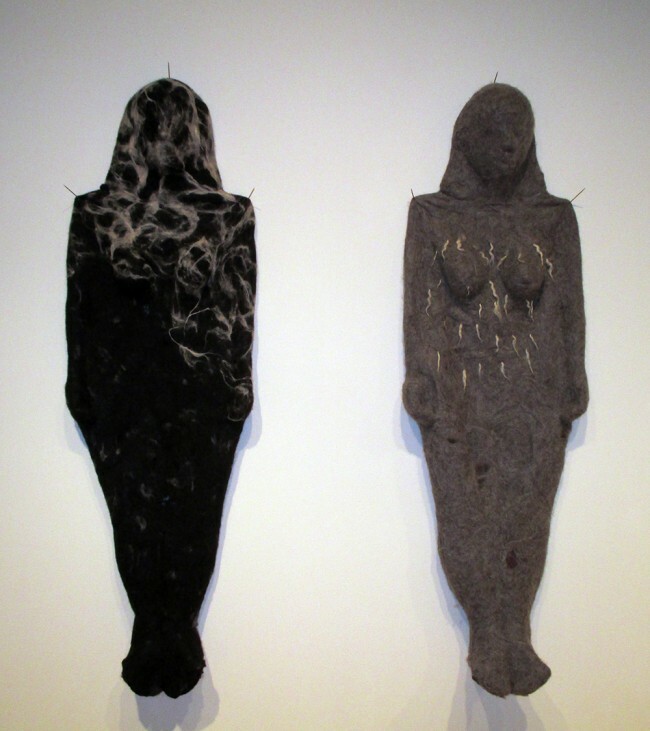 These felted wool and bronze life-sized bodies, strikingly female, are shell-like in appearance. According to the Merriam-Webster dictionary, slough has multiple meanings including, “the cast-off skin of a snake”, “a mass of dead tissue separating from an ulcer” or “something that may be shed or cast off”. I immediately thought of the Selkie, the mythological creature that is a seal while in water and transforms to a human on land when it sheds its skin. For me Slough1 and Slough 3 are about transformation and the idea of casting off the old. Notice how each shell seems to have some kind of growth or dust-like coverings to them, as if they have been cast aside for quite some time. Lisa Jameson’s Excerpts and Auspicion, two gorgeous books created with paper, watercolor, ink and string, are intricately designed and invite viewers to interact with the pages of both books. White gloves are provided for the handling of each book. Kevin Muente’s oil painting, Down by the Tracks, creates a narrative filled with mystery and suspense. A man and a woman linger by the side of a railroad track located in the countryside. A train is seen riding the rails in the distance. Every time I view this image, I have new questions to ask of its characters. Among the other things to see on display are Steven Finke’s gorgeous Buddha and Eastern-inspired bronze and stainless steel creations, Andrea Knarr’s monotype titled Prelude which invokes feelings of peace and a sense of waiting, and many more. Group shows are great because they offer up a fine assortment of artwork that has the opportunity to appeal to larger groups of gallery visitors. Unfortunately that also means there isn’t enough room in this review to mention all of the wonderful artwork on display. The FE14: Full and Part-time Visual Arts Faculty Exhibition, located in the Main Gallery and the Third Floor Gallery on NKU’s campus, is on display January 16 through February 7. Gallery hours are Monday through Friday, 9 a.m.-9 p.m. For more information about current and future exhibits, visit their website at http://artscience.nku.edu/departments/art.html for more details. Comment received from artist Jeremy Plunkett. I just recently read the review Shawn Daniell gave for the NKU faculty exhibition and wanted to give many thanks to Shawn for featuring my work in her article! I was very flattered by the review and thought the commentary was very spot on in conjunction to thoughts I have when making my large charcoal drawings. I also wanted to supply a better quality image of the work that maybe you wouldn’t mind replacing the one in the review with? Also I appreciate viewing the website and I look forward to future write-ups! Sure, I would be happy to provide an image that is a bit better (so I think). It may have too many pixels, in which case it can be dimmed down a bit. I enjoyed meeting you at the faculty reception / dining experience in the gallery last friday. 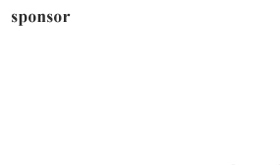 Jeremy, can you provide me with an email address, or email me so that I can attach the image?